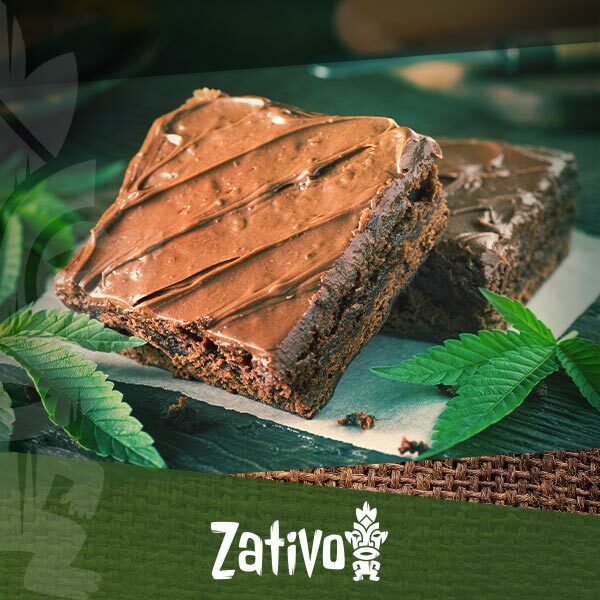 Cannabis brownies are probably amongst the most popular forms of edibles, and certainly amongst the most delicious. They’ve been a reliable consumption method for decades, and for good reason. They’re more potent than a traditional joint and the high will last you up to twice as long. Today, we’ll be teaching you how to create the most potent and delicious brownies. We’ll be following the recipe with a few strain recommendations so that your brownies are the best they can be. Start by preheating the oven to 110°C. Grind your flower to a medium-fine consistency and spread it on a baking tray lined with baking paper. Place it in the oven for 30 minutes. Beware as this will give out a very intense cannabis smell. This process is called decarboxylation. 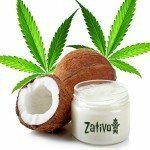 It’s what activates the THC so it can be processed by your liver. Grab a big enough saucepan to hold all of your ingredients and fill it with water. Once the water is boiling, add your butter and allow it to melt completely. Drop your decarboxylated weed in and turn the heat down to low. Allow the mixture to simmer for 3 hours. Try to stir it once every ten minutes or so. It will reduce a lot, so don’t worry once you see this happen. After the 3 hours, allow it to cool, but not harden. Strain it through a cheesecloth and discard the cannabis flower. Store the butter in a sealable container and place it in the fridge. Now you have cannabutter ready-to-go. You can even spread this on some toast and it’ll get you high. But we’ll be giving you our favourite brownie recipe for you to incorporate it into. Preheat the oven to 180°C. Break the chocolate into pieces and melt it. You can do this in the microwave for a few seconds at a time, or in a pan. 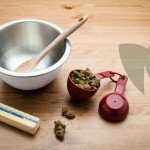 Melt your cannabutter using the same process as the chocolate and mix it with the sugar in a large bowl. Whisk in your vanilla extract and eggs to the mix. Once this is done, mix in the chocolate. Make sure that neither this nor the butter is too hot so that the eggs don’t cook. Sift the cocoa powder and flour into the bowl with the other ingredients. Mix the batter well, but don’t overmix. Transfer to an appropriate baking pan with a spatula, and bake for 25 minutes. 707 Headband is a fantastic strain to use for your edibles if you’re planning on a night out. This sativa-dominant hybrid with up to 23% THC will get you feeling relaxed, energised, and pain-free. You can expect a citrus and earthy flavour with some sweet cream tones. This strain’s terpenes will work perfectly with the chocolate brownies. In case you haven’t yet tried weed brownies, the weed flavour will be very present. It’s important that you have the tastiest strain in there so it won’t be a hard task to eat them. We obviously recommend that you grow your own 707 Headband. Making edibles demands a lot of cannabis flower and you probably won’t get it perfect the first time. It’s better to have cheap weed to spare, and growing your own is the cheapest you can get. You’ll be getting 707 Headband buds in just 9 weeks with a yield of up to 450g/m². If what you’re looking for is an edible that will help you lose 6 hours in front of the television, then Trainwreck is the flower for you. It doesn’t have as much THC as the Headband, but you can still expect up to 15%. This will be a great choice if you’re trying out brownies for the first time or introducing them to a friend. With pine and citrus aromas, Trainwreck will also be a great strain to use for cannabis brownies. You’ll feel like having more than one just because of how good they taste. If you’re planning on growing this fantastic strain, it’ll give you around the same yield as the 707 Headband (450g/m²), but in just 8 weeks. And finally, we couldn’t go without recommending the all-star White Widow. This perfect cross between a Brazilian sativa landrace and an Indian indica has taken over many stoner’s hearts since the mid-’90s. It has THC levels of up to 19%, and you can expect a sativa-driven high. You’ll still feel a few indica traits, but you’ll be overpowered with an energetic, creative, and uplifted state of mind. If you’re looking for a lighter and fresher aroma to your brownies, White Widow is going to be your best choice. Its floral and pine notes go beautifully with chocolate. If you’re planning on growing your own, this plant will flower in 9 weeks, giving you up to 600g/plant in an outdoor setup. That’s a lot of brownies from just one plant.